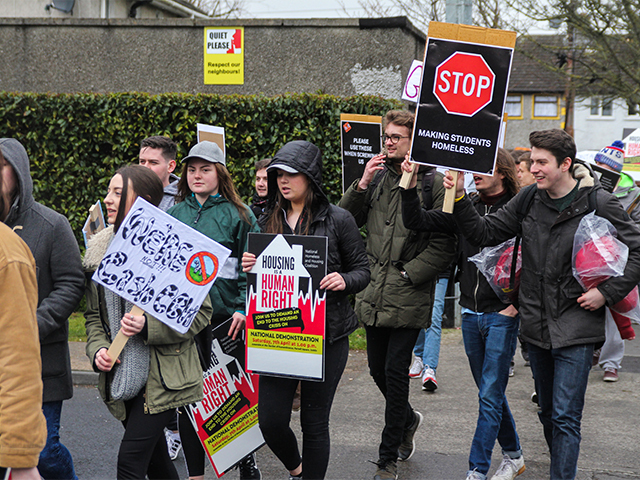 DCU students protested for a second time against the introduction of a 27 per cent increase in rents by Shanowen Square and the 23.5 per cent increase by Shanowen Halls’ accommodation. After DCU received no response from the operators of the complexes after their first demonstration they decided to brave the elements and stage a ‘sleepout,’ which over 45 people participated in, on the 5th of April. “This is to continue keeping the pressure on Shanowen and to highlight the issue to the government,” said Craig McHugh, DCUSU’s Vice President for Education and Placement Elect and Economics, Politics and Law student. Before the ‘sleepout,’ which was officially named Shanowen Shakedown Part 2, the rise in rent by Shanowen came to the attention of the government. Mattie McGrath, Independent TD for the Tipperary Constituency, who raised the issue in the Dáil on the 29th of March. “Student accommodation in Dublin has gone out of hand completely,” said McGrath. Shanowen Square currently provides 338 beds for private student accommodation purposes and at present charges almost €7,000 for both semesters. This covers the cost of what many would call basic facilities. It is also an increase from what it was in 2014 when the price of living there for the full college year was approximately €4,500. “Absolutely not. Like even the cleaning facilities are disgraceful,” said Jack Ormond, a DCU Communications student and Shanowen resident, when asked if his living area was worth nearly €9,000. Shanowen Halls’ is raising its rent to €8,325. Both complexes also require a €400 non-refundable deposit. Due to the ‘licence to reside’ agreement that students must sign to live in Shanowen accomodation, they are not subject to the 4 per cent cap on rent increases. Tenancy leases provide this protection. “What exactly have Shanowen improved to double the price?” Niall Behan, outgoing DCUSU President, asked the protestors through a megaphone. The recent campaign began with a petition by Aaron Harper, a DCU student. “They always say a movement is started by a crazy person and Aaron is our crazy for the moment. It takes two then to make it into a movement and we were delighted to join in with the crazy Aaron Harper. It was really important that this came from the students,” commented Behan. Shanowen Shakedown Part 2 trended on Twitter and was covered by the all major national media sources including RTÉ News, The Irish Times, TheJournal.ie and the Irish Independent. The owners of both Shanowen Square and Shanowen Halls’ are maintaining their silence.